COME SAIL SUP AND YOGA WITH US! Two adventure trips with GoXperience and Kathy Marston Yoga are planned for 2019. A combination of living and sailing on the 51ft Adventure Yacht GoX, Stand Up Paddleboarding tuition, Yoga and SUP Yoga. Plus chilling, swimming, eating delicious fresh food and snorkelling. A proper week of adventure, having tremendous fun! You’ll have the opportunity to learn to SUP, practise land and SUP yoga, engage in a little meditation all whilst sailing the beautiful islands of Vis, Hvar and Brac. Maybe even visit the amazing Krka Waterfalls at Skradin. It’s a chance to downregulate, learn some new skills, practise yoga and explore. The yoga will cater for all abilities, and you’ll learn to move on your board more confidently, paddle more efficiently and powerfully, all in a most breath-taking environment, having lots of fun! Enjoy the opportunity to find a balance of both adventure and relaxation in the beautiful surroundings of Croatia’s coastline. 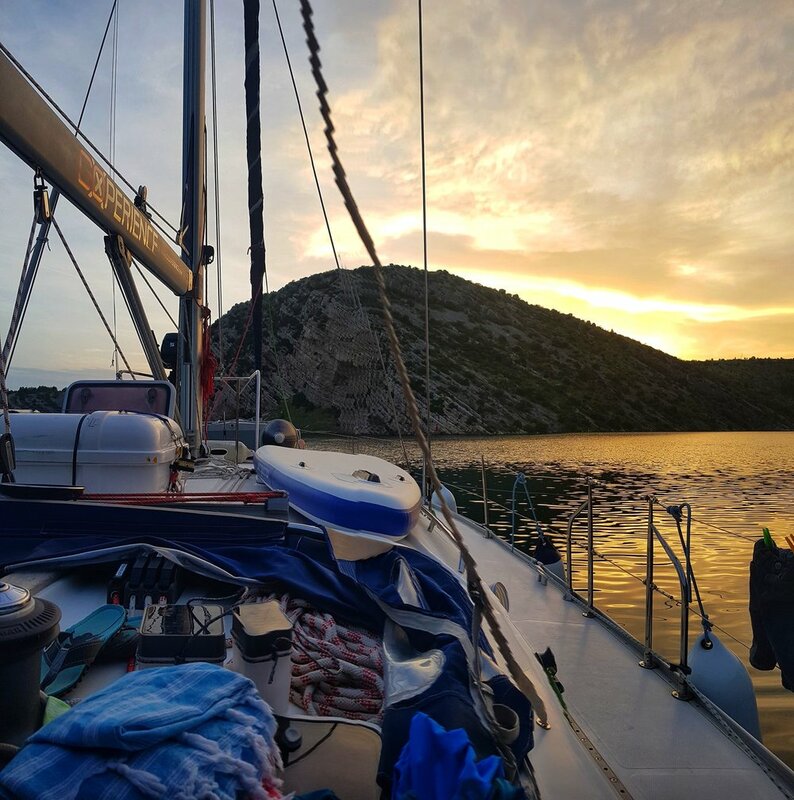 Living onboard a magnificent 51ft yacht, you will be part of the crew of 8 like minded souls, exploring the beautiful Croatian islands, stopping off for some paddleboarding, yoga and meditation with Kathy, experiencing some of the most beautiful spots that nature has to offer. Under the guidance of Captain Nathan Williams, a fun-loving Master Mariner and owner of GoXperience, you will be learning the ropes and experiencing first-hand what it’s like to live onboard, all hands on deck, mucking in to make delicious nutritious meals which we can enjoy on deck whilst watching the amazing sunsets. With many years working at sea, you can rest assured your safety and enjoyment are always at the forefront of his thoughts. Nathan is joined by Kathy Marston, a 500hr Vinyasa Flow yoga teacher, a certified SUPyoga instructor and SUP instructor (Bsupa and British Canoe qualification). Kathy teaches land-based yoga, Stand Up Paddleboard Yoga and SUP tuition and is extremely patient and passionate about getting people moving and out on the water, building up their confidence to be able to SUP and have their own mini adventures. With her skills and guidance, she’ll have you standing up and paddling efficiently in no time at all. Once you’ve mastered the basics, you’ll quickly build up the strength and skill to paddle further distances and explore the many beautiful coves and beaches of Croatia, ideal for a little land-based yoga and meditation. Kathy’s love of SUP and yoga will definitely help you gain the confidence to move more fluidly out on the water. Water and yoga – the ultimate in relaxation and it invariably ends with a few giggles! There will be a lovely mix of beach yoga, Stand Up Paddleboarding tuition and SUP Yoga, enough that you leave with new skills but still plenty of time to soak in all the health benefits of being outdoors, relaxing and practising a little mindful meditation, drinking in the glorious Croatian sunshine and sea air. As a beginner, you will start your SUP experience learning to kneel, stand and turn, and also how to get back on your board. It will all be done at a leisurely pace, with plenty of chill time and SUP games if desired. The yoga will be gentle enough for beginners and will help you to warm up correctly, and stretch any worked muscles at the end of the day. There’ll be a whole week of opportunity to share her knowledge and expertise, so that once you leave Croatia, you will feel confident and able to SUP with ease at your next opportunity. Part of the onboard experience is enjoying living and dining together, and the climate is perfect for eating out on deck, making the most of the balmy evening sunsets, re-living the day’s magical moments and doing a little star-gazing, perhaps with a glass of chilled wine if you wish! Kathy’s loves are being outdoors and sharing all her wellness knowledge, combining good food, exercise and that important chill time into the day. With so much fresh air sleep is usually good onboard! The week is all about mucking-in, lending a hand and learning the ropes. Prepping meals and under the watchful eye of Nathan, ensuring we’re sailing smoothly so that you’ll soon be sailing like a pro. If a friend or partner would like to join the trip and enjoy boat life but without the SUP and Yoga experience, then we can offer a small discount. With easy flights from Bristol, Gatwick, Stansted and Luton, and only 15 minutes to the marina where you will join the yacht, this is the perfect way to jump onboard a life-changing experience. The yacht is a Gib-Sea 51, with 5 double cabins each with its own en-suite. She is big, comfortable and perfect for exploring Croatia. Although the cabins are shared, this is all part of the onboard experience, and the cabins can be made into doubles or twins, depending if you’re there as a couple or a single (We will assign your sleeping arrangements appropriately so that you feel comfortable). All cabins have their own ensuite bathrooms. The yacht is based in Marina Kastela, near the famous city of Split in Croatia. Centrally located along the amazing coastline and perfectly situated to head North or South. Croatia has 1247 islands to explore and we can tailor your experience to suit you (weather conditions permitting). We use the latest and best equipment. We use Red Paddle Co and McConks 10’8” inflatable boards, which have amazing stability. They are ideal all-round boards, whether you have paddled before or are a complete beginner and are great for practising yoga on. As part of the yacht’s equipment, we have a tender (small boat) for getting ashore and snorkelling equipment for everyone to enjoy and use at their leisure. Although we may need to ‘adjust our sails’ according to the weather conditions, a typical day will involve some yoga, paddleboard lessons, delicious food, sailing to a beautiful location, gentle SUP adventures, swimming, snorkelling, more delicious food and a good nights sleep! Fly from your chosen airport to Split. There are early morning flights from Bristol, Luton, Stansted and Gatwick which arrive in Split mid-morning. It’s a short taxi ride to the Marina Kastela, where you will be welcomed onboard and can settle in and get your tour and safety briefing. 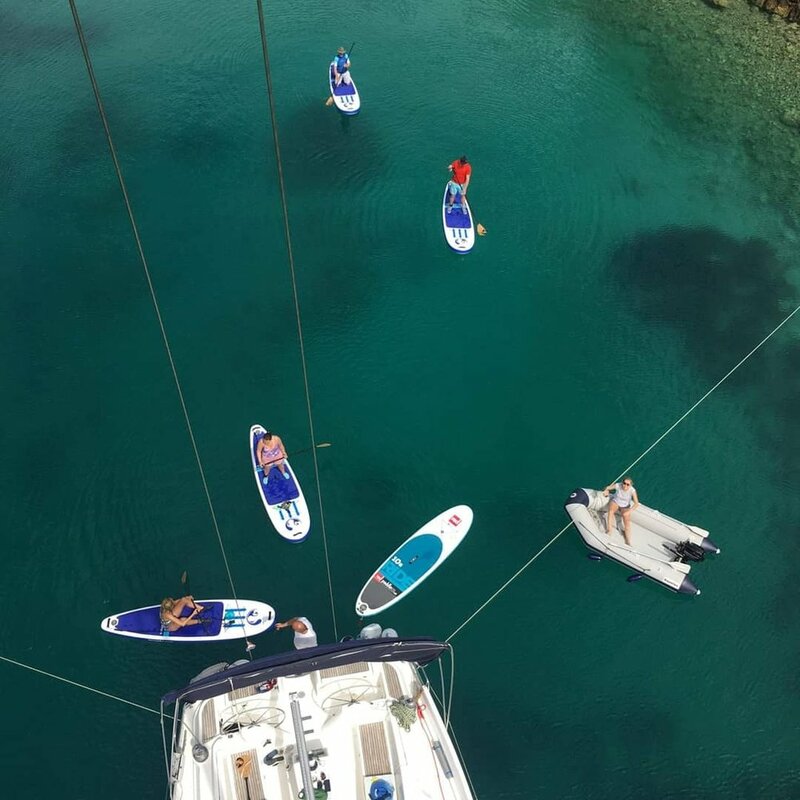 Lunch will be waiting for you onboard and you can enjoy it as we set sail to the island of Solta,where we will get the boards in the water and enjoy a little sunset SUP Yoga, followed by meditation on the beach. Dinner will be on the boat, followed by settling down for an early night ready for the next day’s adventures. The following days on the boat will start with early Yoga, and then a relaxed nutritious breakfast onboard before setting sail to find a quiet spot for some lunch, some SUP lessons, adventures, snorkelling and swimming. Most evenings we will dine onboard, shopping for supplies as we need them, enjoying fresh fish, mangoes, coconuts, fresh fruit and vegetables, although for an extra-special evening, we will dine at Nathan’s favourite fish restaurant on Hvar, which is only accessible by boat. We can accommodate special diets, but do please let us know before booking so we can discuss your needs. On the last day, we will take our flights back from Split in the morning, after a breakfast with our crew mates and be home in the UK by lunchtime, feeling refreshed and revitalised.